For the second year in a row, deployments of fiber-optic cable in China should decline year-on-year, according to CRU. And, for the second year in a row, deployments elsewhere in the world should offset this decline and lead to overall growth – just not as much in 2019 as in 2018, predicts the market research firm. In recent years, China has accounted for more than half the world’s total annual demand for optical cable. China’s telecom network operators have installed fiber in the full range of telecom applications – inter-city, intra-city, FTTx, and mobile cellular systems. And as in other countries, China also has companies and government authorities installing fiber systems to support the electric power grid, railways, highways, pipelines, airports, WiFi hotspots, data centers, and many other applications. Fiber deployments in China declined 1% in 2018, according to CRU. However, fiber-optic cable roll outs grew 10% everywhere else, leading total deployments to rise from 492 million fiber-km in 2017 to more than 500 million fiber-km in 2018. 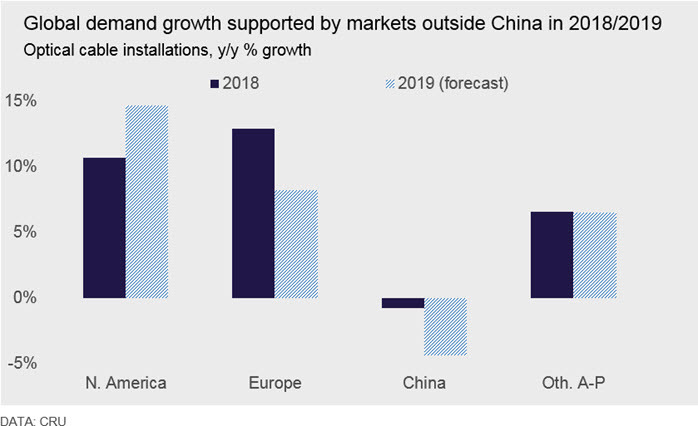 Fiber cable installations in China should decline even further in 2019, CRU predicts. The country’s three main service providers have largely finished their 4G mobile and fiber to the home (FTTH) roll outs, the market research firm asserts, while 5G requirements for now are limited to a relatively small number of metro markets with large field trials. The transition period in China is not unusual. With the exception of a few carriers in Japan, South Korea, the US, and a few other countries, full-scale 5G construction is not expected until 2020 or later. What’s different about China is that the country’s carriers completed vast 4G and FTTH projects in a relatively small number of years, causing unusually high levels of fiber demand during those years. With China’s FTTH networks now having passed over 90% of homes, and with more than 80% subscribing it has become increasingly clear that China’s FTTx and 4G markets have become saturated with fiber and that demand from both sectors will be softer this year. As was the case last year, fiber deployments everywhere else should continue to increase – but this time just by single digits. For this reason, CRU expects the overall market to grow by 2%, half of last year’s rate. With a few exceptions in such markets as Japan, South Korea, and the U.S., carriers won’t substantially increase fiber deployments for 5G backhaul until 2020 or later, CRU forecasts. Should such delays cause a further slowing in fiber deployment growth, the end of a fiber deployment boom could be at hand. CRU notes that fiber installations enjoyed a 14% compound annual growth rate (CAGR) between 1997 and 2017. This led to annual fiber deployment totals to rise from 37 million fiber-km in 1997 to 2017’s 492 million fiber-km. CRU also notes that it took operators nearly 30 years, from the late 1970s to 2008, to deploy 1 billion fiber-km. Network operators deployed half that total last year alone! 5G will be a key variable in fiber demand for many advanced telecom markets, including China over the coming years. The reason is that 5G construction will need fiber to link a much denser array of cell sites than in 4G networks. 5G networks will also support communications between many devices other than smart phones, tablets, and computers. Examples include automobiles, trucks, cargo containers, point-of-sale terminals, vending machines, smart-grid equipment, smart-cities and smart building equipment, and many other types of devices. These systems will rely on connections to new data centers, which also will drive demand for fiber. 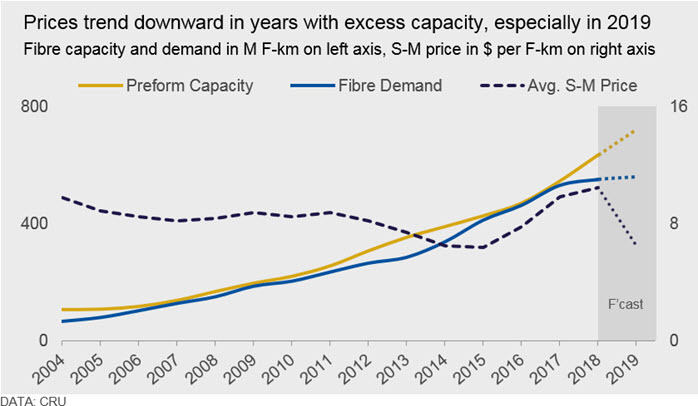 Despite the recent softness, CRU forecasts China will account for approximately 50% of the growth in total global optical cable demand between 2018 and 2023 and will remain a key driver of demand mid-term. This entry was posted in 5G, Fiber optics in China. Bookmark the permalink. Wow, fiber passes 90% of the homes. That is an amazing number. I wonder how that is measured. For instance, does fiber to the basement for a multi-dwelling unit count as FTTH, even if copper is used to as the transport between the basement and the individual units?